To be honest we had quite a bit of employee pushback when we said we were growing a Bergenia- I’m sure they immediately thought of that hulking, horrible looking, weevil notched ground cover with clouds of pepto pink flowers in winter/spring. That old horribly abused plant is definitely not this. HUGE round leaves have light fur on the reverse and make a wonderful statement in part shade to full sun (with water). 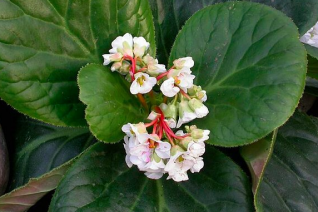 In very early spring this cultivar named by Richie Steffan of the Elizabeth Miller Garden in Seattle- sends up wide inflorescences of pink tinted white flowers. Best with overhead protection of trees to ensure a late freeze doesn’t damage the flowers. This is a DECIDUOUS species and doesn’t seem to be root weevil food or suffer a bad looking period. New leaves ensure freshness all season. Give it a LOT of room to spread. Tropical looking foliage adds bold dimension to borders, woodlands. Regular summer water in well drained rich soil. Thanks Richie.